Between Japan's earthquake and Thailand's flooding, hard drive makers had a rough 2011 with year-over-year shipments declining 4.5%, but the industry is well on its way to rebounding. IDC reports that the cleanup of manufacturing facilities should conclude in the first half of 2012 and assuming disaster doesn't strike again, production should return to preflood output levels in the latter half of this year. The resurgence is expected to bring a boost in shipments of 7.7% on-year, with a compound annual growth rate (CAGR) of 9.6% for the five-year period between 2011 and 2016. The research outfit also expects 2012's hard drive revenue growth to exceed the year's shipment growth as manufacturers take the chance to jack up rates and reverse some of the "excessive price erosion" we've seen since 2009. "In many respects, the hard disk drive industry has collectively hit the 'reset' button," said John Rydning, research VP, Hard Disk Drives at IDC. 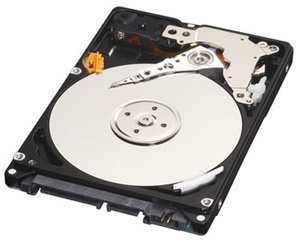 Rydning explained that hard drive prices will gradually decline "at a rate that still delivers value to customers," while letting manufacturers bank enough for developing new technologies that boost drive capacity, performance, reliability, power consumption and security. Although increasing prices will help pad bottom lines in the short-term, Rydning noted that hard drive makers will still have to innovate and maintain a diverse portfolio to ensure long-term growth. This will include hybrid drives that combine disk storage with flash memory, such as Seagate's Momentus XT series. Such devices could generate a revenue $50 billion by 2016, assuming a five-year CAGR of 8.6%. IDC believes HDD manufacturers must address the emergence of flash storage by convincing PC vendors that hybrid solutions are a better value. Additionally, the firm notes that the rising popularity of mobile devices such as smartphones and tablets is affecting PC sales and thus HDD sales. Instead of buying drives in new computers, people are increasingly interested in centralized networked storage.